This is a tutorial on an wildlife digital painting I created for an online drawing and painting competition website. This is the final output I achieved, you can take a closer look at the medium sized image here and if you wish to have a printed copy of this digital painting, you can order one from here. 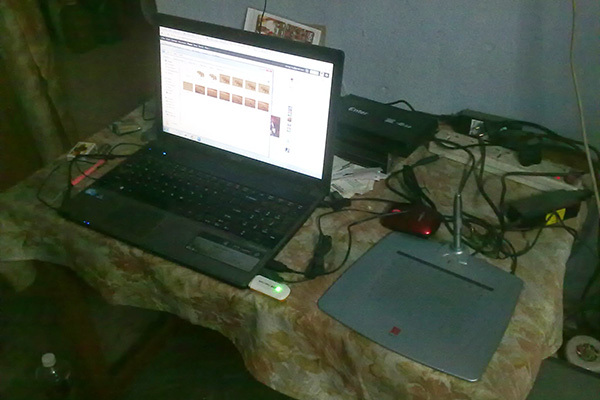 This is my studio - well not a bigger one - ha ha, actually I work from home and my set-up is inside my bedroom. I have two laptops (you can see the newer one, an Acer Aspire 5745 with Intel Core i5-430M cpu, 3GB ram, 500GB hard-disk running windows 7), one external hard-drive (Western Digital ) for archiving everything I own and an iBall 5540 drawing tablet. The tablet is the newest addition - earlier I had the same model with only 512 pressure sensitivity levels - it gone dead serving after several years while I was working in an animation studio. Later I didn't need one because I shifted to graphics design. This January I felt in need of some digital sketching and drawing - specially for some mascot designs, so I got this one - though this is the same model from the same manufacturer, it has 1024 pressure sensitivity levels. Whatever you can find here on scorpydesign - I have designed on this desk. To start with, here is the sketch - I took reference from some photographs found on national geographic and then sketched based on them with a thin brush. The canvas size is 36" wide and 24" high at 120dpi. 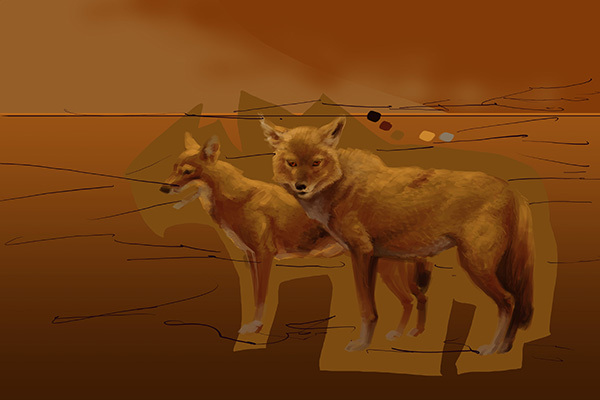 Initially I sketched the jackals and the background on two separate layers - I cudn't made-up my mind on the background, so I didn't give full attention over it. I started filling out the color - firstly I took a new layer under the jackals sketch and selected overall area with lasso tool, then filled up the whole area with a flat color. 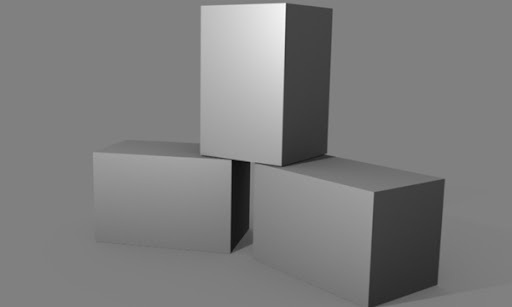 Then I sampled major shadow and highlight colors based on the flat and started painting out the main blocks. Throughout the whole digital painting procedure, I used only one preset-ed chalk shaped brush with 4 variations - 60pixels and 30pixels in size and size and opacity mapped to pen pressure separately. I put these 4 brush presets at the end of my brushes collection sequentially so that I could switch between then pressing < and > without opening the brushes menu. The jackals have short furs on their body - I brushed in the same direction and as polished work is not my style so i somewhat roughly painted it. In this phase, you can see I have blocked the main colors on the jackals. 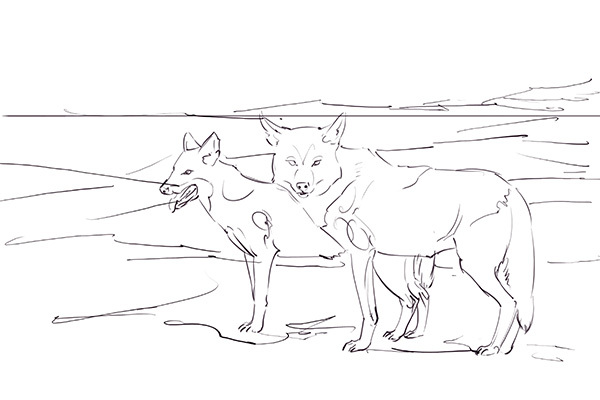 I turned off the sketch layer for the jackals to see if I was missing something. 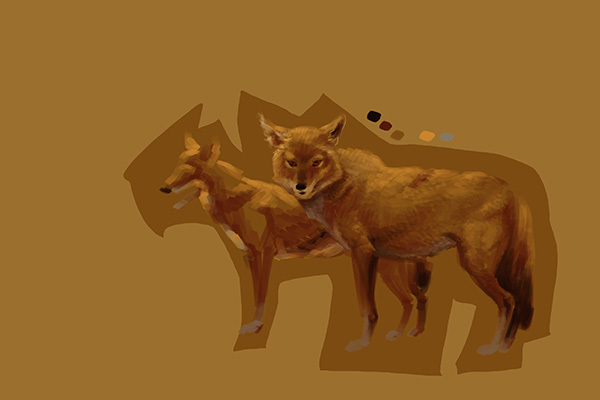 I blocked-out the main color schemes on this digital painting using the 60 pixel chalk brush opacity set to pen-pressure, now I felt to see how it would be with details, so I shifted to 30pixels chalk brush with pressure sensitive opacity to add details on the first jackal. I fixed volume on some certain areas such as rear legs and neck. To do so, sometimes I filled it with solid colors again with the bold brush and then again added details with the thinner brush. 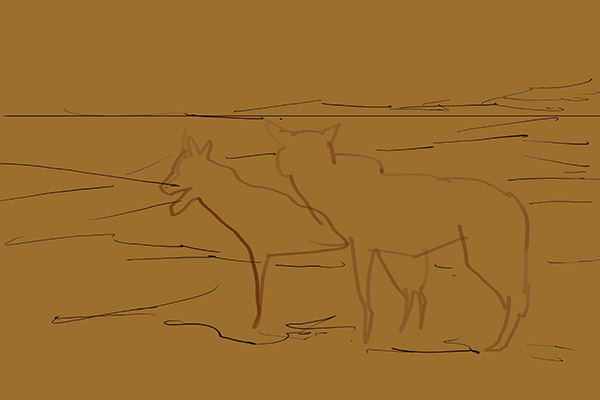 I didn't worked on the details on the edge of the figure, as I will be going to erase the extra-fills later to merge the jackals with the background. I will not paint the legs of the jackals till the background is finished. I finished painting the first jackal. Now I though about setting the mood for painting the background. I turned off the jackals sketch and painting layer and added a new layer under the background sketch. I filled it up with a flat color same as of the base color I picked for the jackals. I turned on the painting layer of the jackals and sampled colors from the painting to fill up areas on the background. 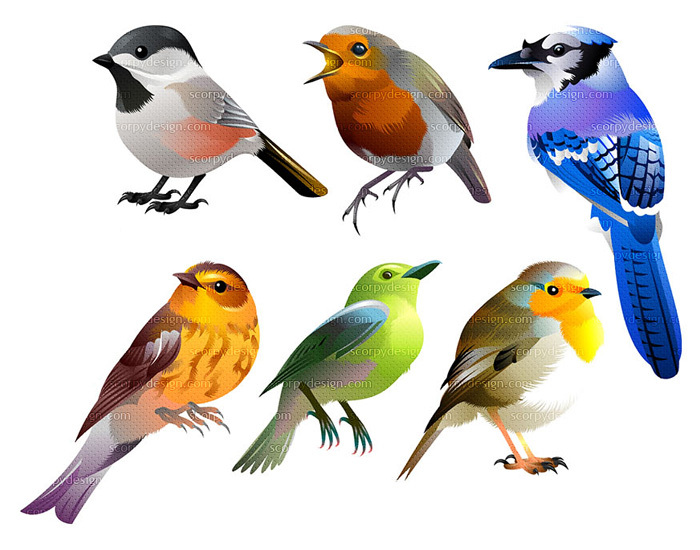 In this phase, I used gradient tool, large 300 pixels airbrush etc to block areas. I switched back to 60 pixels chalk brush again to paint the details. You can see I started adding the details to the sky and cloud here. 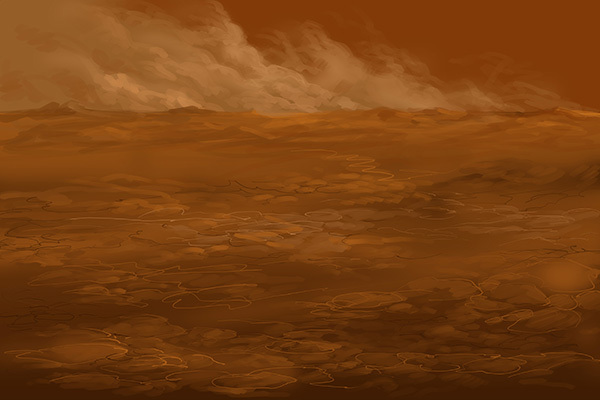 I didn't use the thinner brush a lot on the clouds as they were going to be out of focus. When the sky and cloud is finished I started painting the ground. 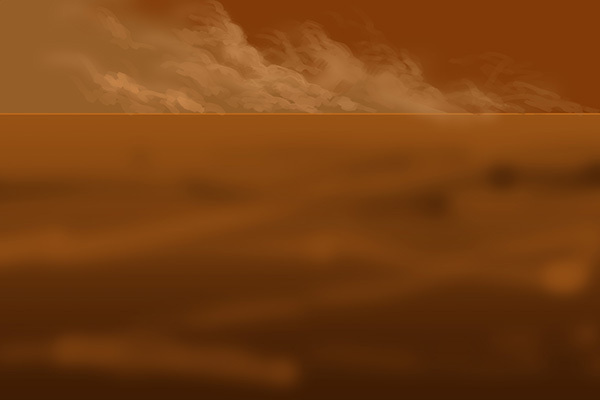 The far hills and rocks at the horizon were at the same focal depth as of the sky so I haven't add much details there, but as the focus decreases, I added more and more detailing to the ground. When the background is finished, I turned on the jackals digital painting layer. I also erased the extra fills from this layer. I wanted to have a look at the composition and when satisfied, I can proceed now to paint the other jackal and adjust the former one. Later I would also touch-up the grounds to finalize. As I did for the first jackal, I added details on the other, firstly using the bold brush and then refining it with the thinner one. In this phase I also started adding details to the edge of the figures and started painting the legs matching with the background. Fur is painted using the 30 pixels brush with pressure sensitive size. I added more details to the jackals, painted the eye, tongue and fangs. I painted the furs, ear and tail as the furs on those portions were going to overlap with the background. 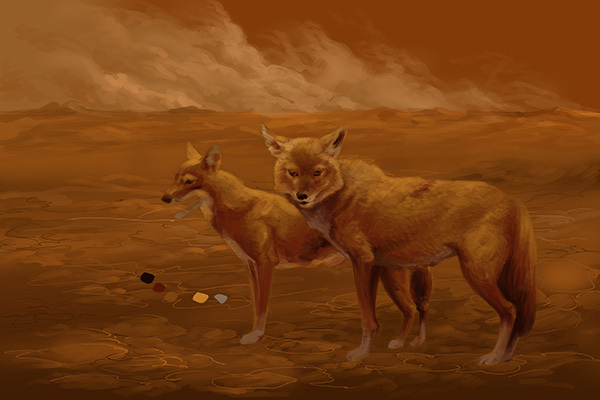 I alsoo darkened the background beneath the jackals with the large 60pixels brush to render shadows of the creatures on the ground. And this is how it looks when I am finished. You can take a closer look at the medium sized image here and if you wish to have a printed copy of this digital painting, you can order one from here. Thanks for reading this far. How did you like this steps guide for this digital painting? Please add your comments and suggestions below.